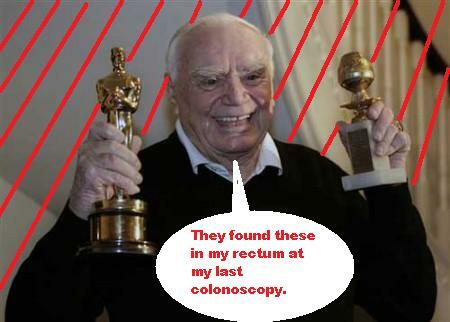 Screen Actors Guild wants Ernest Borgnine to die. Home → Damien Zone → Screen Actors Guild wants Ernest Borgnine to die. This year’s SAG Lifetime Achievement honoree, Ernest Borgnine. He will be honored with the Screen Actors Guild Life Achievement Award at the 17th annual SAG Awards, to be held January 30, 2011. In essence, the Screen Actors Guild is telling Borgnine, in its own loveable way, that they want him to hurry up and die. He was born on January 24, 1917 in Hamden, CT and is a well-known actor of television and film. His career has spanned more than six decades. He was an unconventional lead in many films of the 1950s, including his Academy Award-winning turn in the 1955 film Marty. On television, he is best known for playing Quinton McHale in the 1962-66 series McHale’s Navy, costarring in the mid-1980s action series Airwolf, and voicing the character Mermaid Man in the animated series SpongeBob SquarePants. Borgnine earned an Emmy nomination at age 92 for his work on the series ER. Ernest Borgnine is also known for looking like he was 95 when he was 35 so that has served him well too. "WE BOUGHT A ZOO" Straight to video. Sponge Kabob Square Pants Flees Egypt.